It got me thinking. What would the 2001 version of myself think of the 2011 me? Would she be proud? I’m pretty sure I wouldn’t think of myself as a point-making hussy. So that’s a win. What would surprise me? What would disappoint me? 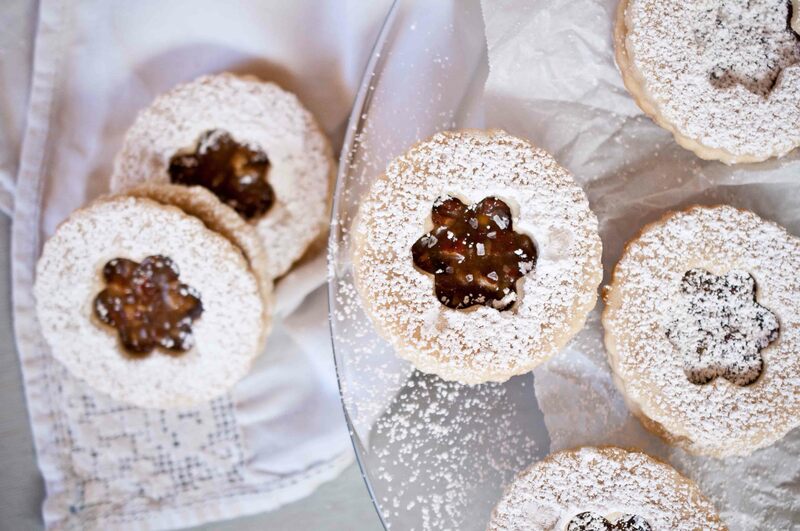 I’m pretty sure I would be shocked that I make Linzer cookies and have a food blog. Ten years ago I was just trying to figure out how to cook, skipping steps and trying to cheat recipes. Am I going to be proud of the 2021 version? That older model with the inevitably fancier techno-gadgets and an 11 year old daughter? What would she tell me? What would I remind her? Where do you want to be in 2021? Or even the end of 2012? What is stopping you? Make yourself proud, that 2001 version, the 2008, 2010 version. 2021 is going to come whether you like it or not. Where do you want to be? Think about those goals you have neglected, like books on a dusty shelf. Those ones you would be embarrassed to have to answer to 2006 for not having even attempted. They seem overwhelming, but you don’t have to do it all right now, just take a step. One today, one tomorrow. Order a catalogue from a college that has the major you have been thinking about. Start a business plan for that small business you want to start. Or just buy the domain name (about $10 at godaddy.com) for inspiration. Leave that boyfriend that treats you like crap. Take that photography class because you know that photo is in your blood you just have to figure out what aperture means. Take on a part-time job so you can save for that trip to Europe that you are always talking about. Be the person you wanted to be ten years ago. It takes work, but it’s worth it. If was easy it wouldn’t make anyone proud. 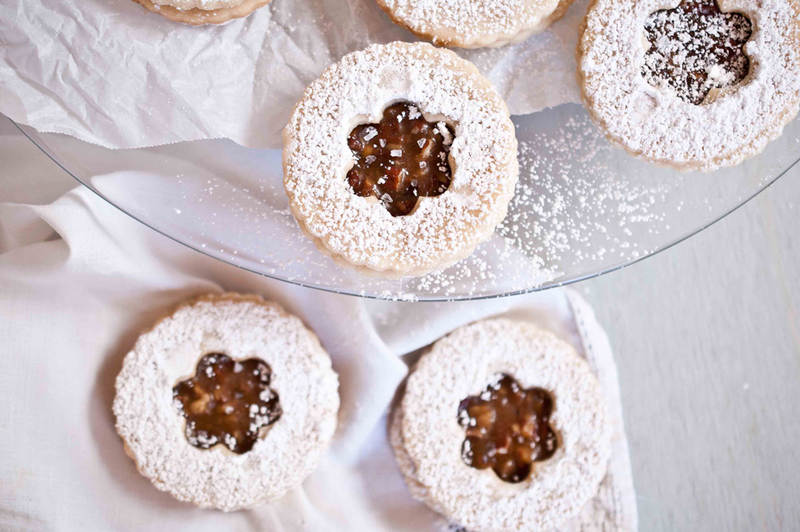 Linzer cookies are a sign of progress in my life, I never would have tried this ten years ago. And the look so fancy! Once the dough is chilled, roll out and cut into 2 1/2 inch circles. Use a small cookie cutter to cut out a small window in the middle of just half of the cookies. Allow to cool. Top the window cookies with powdered sugar, if desired. In a large sauce pan over medium high heat, combine butter, brown sugar, and corn syrup. Bring to a boil, stirring frequently until the sugar has dissolved. Allow to boil, without stirring, for about 5-7 minutes or until the sauce has turned an amber color. Remove from heat, stir in the pecans, vanilla and the cream and stir until combined. Allow to cool until thickened, but not hardened. You don’t want to make the caramel sauce too far in advance because it will harden in the pan once cooled, making it impossible to add to your cookies. Add about 1 tsp of the caramel mixture to the middle of the solid cookies (the ones without the cookie cutter windows) be very careful not to touch hot caramel, it will burn the crap out of your fingers. Use two spoons to get it into place without needing to touch it. Top immediately with a cookie with a cookie cutter window. Sprinkle a few grains of salt in the window. I used a super fancy large grain salt my sister bought me for my birthday. Yes, I am now the sort of person who gets excited to receive a box of super fancy salts from all over the world as a present. Take that 2001. Allow to chill in the fridge until the caramel has set, about 30 minutes. I love this post. It is very inspiring! I originally clicked on it because if you say “pecan” then I will probably make it. But, after reading it its already got my head ticking. Ten years from now my daughter will also be 11. I hope to have gone to culinary arts school. Maybe I’ll own a small bakery or cafe. Somehow though, I want to make a living with food…nothing makes me happier than twirling around the kitchen and pouring my heart into food. Thank you for inspiration today, it is appreciated. I hope you do! There is no reason why you can’t . If other people do, why not you too? The cookies look so perfect! I really really love your post! It got me thinking, who would have thought I would be a food fanatic and blogger! Thank you for your words! That’s great, Ruth! Isn’t it fun how much life changes? I was the same! I had all these reason for NOT having a baby and I wasn’t sure I even wanted to ever be a mom. And now I feel like the luckiest person in the whole world to have such an amazing, beautiful, perfectly healthy little girl. So glad that I evolved and changed in the past 10 years. This post is so inspiring! I saved it so I can read it again 😉 And your cookies are way beautiful ~ you should totally be proud!! These are some gorgeous cookies. Also wonderful sentiments. I have a habit of telling everyone who has little kids to enjoy it as mine are older and I miss those days. But it’s true that while you’re in that stage you really don’t want to hear it. I have to say I’m pretty happy with where I am at in life. I had a goal in life and stuck it out for 23 years, and this past summer I finished what I set out to do. It’s a pretty amazing feeling I have to say. Now to set the next goal and see where life leads me. You given some great advice here, people get so busy living life they forget to enjoy it. You are totally right, Kim. And congrats on whatever that 23 year goal was 🙂 It’s so important to continue to make and set goals. I know you are right about the baby years going by too fast, and I appreciate it more and more every day. It was hardest for me when Tater was 4 weeks old, had nasty colic, cried in 6 hour stretches, I was alone all day and none of my friends had kids. I was upset when people would look at me and ask if I was having SO MUCH FUN! and I felt like I was doing it wrong! These days, I have such an appreciation for this time in my life and I feel lucky to be here, I know I will miss it so much when it is over. Life is much about appreciating the great things about the phase of life we are in and trying not to look forward or back too much. These are so festive and perfect to give out for christmas! I have never seen a caramel linzer either! These look and sound delicious, fab photo too. Wow, lots of great ideas here Jackie. Funny thing that, looking ahead. The only way to get where you want to be is to take the first step. Great tips for taking that first step! 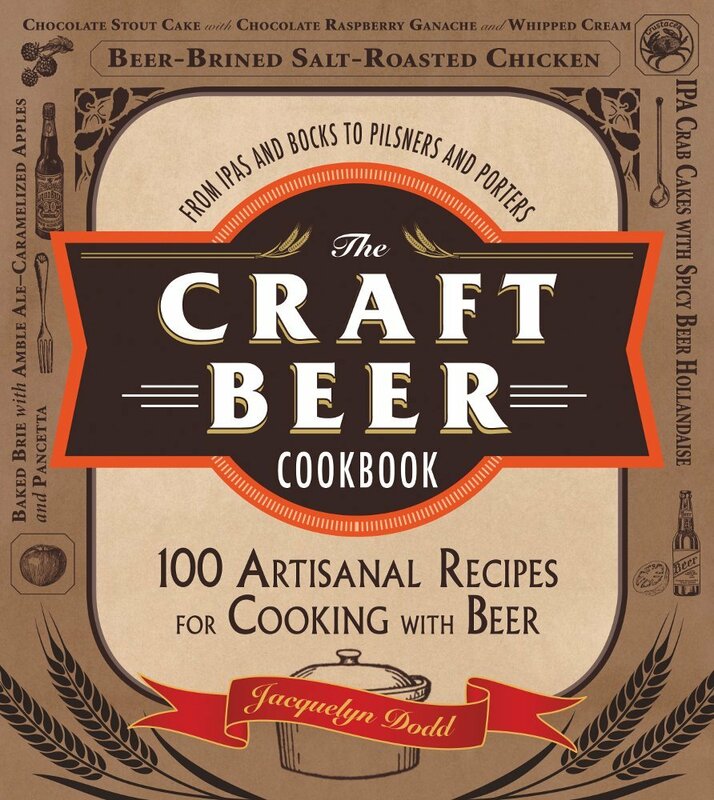 Liz and I decided this morning that we are going to take steps to learn how to taste and describe beer better. A small trite thing I know, however, it is the first step on my path to being a better beer informer. I think that’s a great goal! Who know where it will take you and an afternoon with your wife sipping beer sounds like a pretty fantastic way to spend a day. Win, win. And of course your cookies are perfect! !